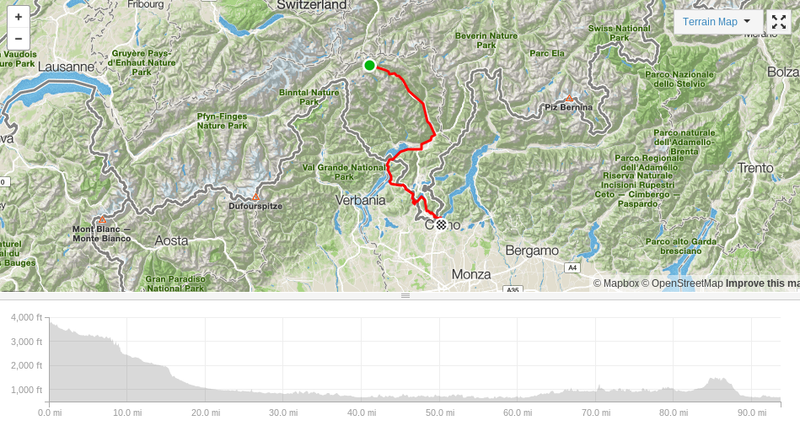 After yesterday’s monster climb, we had the pleasure of spending most of day 3 descending. 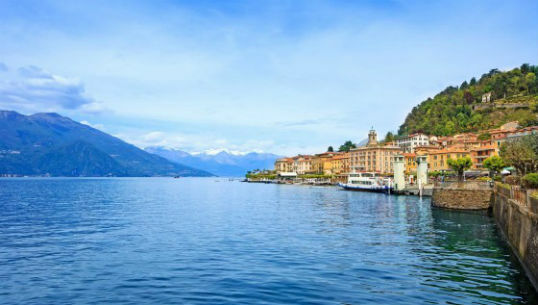 It was also the first day we’d be cycling in Italy: the combination of lakeside cycling, gelato, and balmy temperatures made it an inviting prospect! Thankfully there were no alarm shenanigans today and I was able to eat my breakfast at regular speed. People clapped and cheered when I appeared on time – a nice embarrassing start to the day! Today’s route was pretty special: the 32 miles between breakfast and the first refreshment stop was entirely downhill, and we made it in around 80 minutes. The sweeping descents mean there was barely any need to apply brakes, and the temperatures – a refreshing 23° at top, 32° at bottom – didn’t require any special warming gear. This section was where I (and probably most of us) hit the top speed on the trip: just shy of 45mph. We rode through towns, along tracks through cornfields, through cul-de-sacs, the sun blaring on us all the while. We saw a glider spiralling down through the valley (presumably doing Glide25). It was lovely riding. 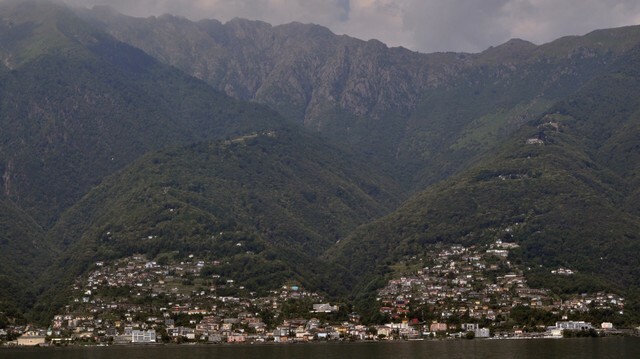 At one point we approached a small hill, knowing that the first Italian lake was on the other side. Steve wanted to take pictures and shouted “stop when you see a beautiful view!” – a redundant qualifier for next 60 miles or so! The lunch stop caught us off guard a couple of miles earlier than we were expecting, which is always a pleasant surprise. 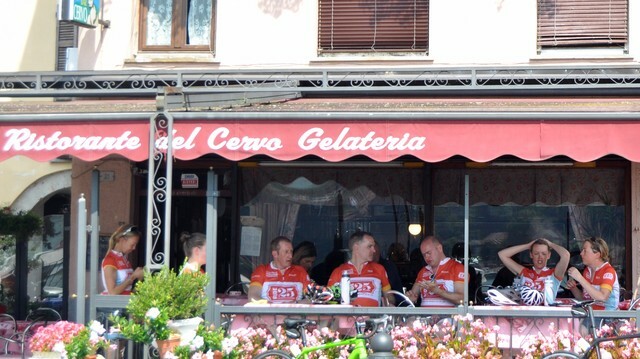 It was just a few hundred yards past the Italian border, so the top-notch pasta was very apt. There was a slight post-lunch malaise, where the mileage we’d done so far on the trip and the high temperatures took their toll. The average speed of the group dropped a bit. 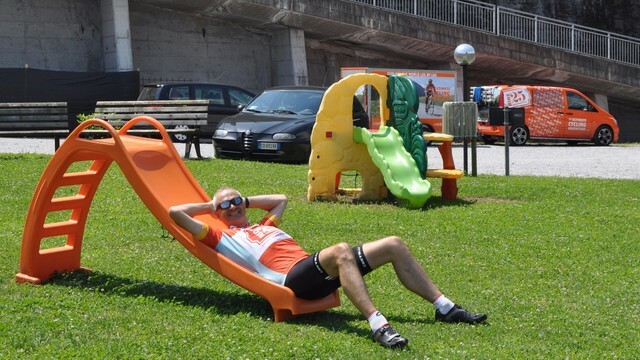 This wasn’t a problem though – it let us cool down and appreciate the great views that come as part of a day’s cycling in Italy: we passed lake after lake, with intervening sections of tree-lined curvy roads. The landscape seemed intent on providing endless and varied excellence, and the confectionery did the same – gelato everywhere! The windiness of the route and the Swiss-Italian border meant we flirted with the border for most of the afternoon, and crossed between Switzerland and Italy a couple of times. Smudge had warned us that border guards may stop and search us, depending how zealous they were feeling, so we kept our passports handy. There were no stops in the end, though. Presumably groups of sweaty cyclists aren’t suspicious (nor particularly inviting as prospects for frisking). Due to a fortuitous map error we managed to dodge a huge hill that was supposed to be on the route, which enhanced everyone’s mood slightly. Instead we had to navigate the hair-raising and traffic-filled roads that made up the final stretch, before arriving at the hotel, dumping our stuff, and clearing the bar out of beer in one round – tell them to stock up next time! The lack of beer was remedied at desert, which was several carafes of lemoncello and ‘meloncello’: an ambitious offering, especially with the ambiguous alcohol volume and an early start in the morning! “Tomorrow” was the answer. A lovely thought to take to bed the night before another hilly day.